The last hope of the entire chicken population lies with a young rooster! 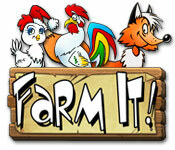 Grow your own chicken family in Farm It! Visit four countries and go through tough ordeals, outwit the Polecat, an annoying Skunk, and other treacherous animals. Cheer up all the hens and make as many chickens as possible in this fantastic Arcade game! Grow your own chicken family!